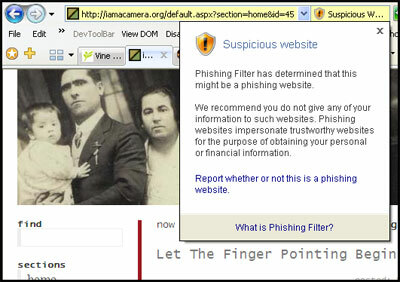 IE7's new phishing filter wasn't quite sure initially if these shady characters were on the up-and-up. I was mildly amused and mildly annoyed seeing the IE7 phishing filter dialog appear when I viewed my website a couple days ago. The good news is that the IE7 phishing filter allowed me to lodge my opinion on whether this was or was not a phishing site. I think they agreed with my assessment because the warning disappeared a couple days later. Interesting concept to try to determine in realtime whether the browser is pointed to the real site or an impersonator. Although I pretty much have no idea what you are talking about, I thought I'd say hey! I really like Addison's music, wonder why I've never heard of her. I hope your family is doing well! We love you guys! Thanks, Rachel. Yeah, it's pretty geeky around here. Addision is from Austin and she sings at our church every so often. Thanks for stopping by!